Including various diamond tools, 8 clamping cylinders, 4 side stops, etc. Due to a change in the model (disc), we sell our latest tools with a 50% discount. The bestselling system in the world. Including polishing tool (2 cutters) with monocrystalline diamond finisher for high gloss finish. Made 2018. Only slight traces of usage. WOLF MAC 3.1 – made in year 2000 – functional, tilting angle -10° – 60°. Including polishing tool (2 cutters). Parallel reference bar (back stop) available. WOLF MAC 2.1 – made in year 1994 – feed motor defect, tilting angle -10° – 60°. Including polishing tool (2 cutters). Used edge polishing machine BERMAQ AM2. Including diamond tool with quick changeable teeth EURACRYL ES. Made 2002. Milling max. length 1400 mm. Milling max. thickness 90 mm. Used edge polishing machine BERMAQ AM. Edge polishing machine with 2 m milling length. Tilting vacuum table. Milling thickness 100 mm. Made year 2000. 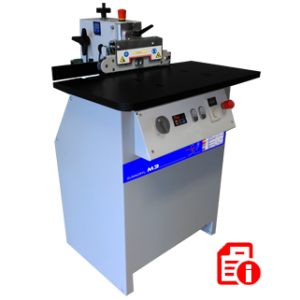 Used edge polishing machine CODEMA EE-TI. Because we purchased a new from November 2018 we offer an universal high gloss polishing machine with 2,10 m processing length. Tilting head -5 ° to + 56 °. Milling size at 0 ° = 2.100 mm x 120 mm. Vacuum clamping line. Diamond milling head. A spare milling spindle. The machine can be demonstrated at any time – even on the weekend. Price: on request. Transport can be arranged. With charge also with Euracryl-Polishing system.